About a month ago, Heart FM, my radio station of choice while driving, was doing a competition. Nothing unusual about that as they always seem to have one competition or the other going at any one time. I can’t quite recall exactly what it was that the contestants had to do but the winning prize was tickets for two to a top hollywood movie premiere in the West End. The presenter of the programme promised that the winners would get to walk the red carpet along with the celebrities. I usually imagine winning fantastic prizes on competition which I never actually enter and fantasize about what I’d do with my winnings, whether they be cash, holidays or cars. However, on this occasion,I didn’t actually covet this particular prize. I’d only ever seen clips of premieres on TV and they didn’t strike me as something I’d enjoy. On one hand, you have the celebrities walking down the red carpet sporting the latest creation of some designer or the other, hundreds of camera flashes going off as the paparazzi strain to capture the photograph of the year and members of the press conducting interviews with the more popular celebrities. On the other hand, you have the teeming masses standing outside the cordoned off red carpet area, screaming and yelling at the passing celebrities, demanding autographs and hand shakes. They are shoved back every now and again by burly security officers as they push against the barriers trying to catch a glimpse or touch of their favourite star. This is sometimes made even worse by the weather but those faithful fans usually turn up en masse come snow, rain or sleet. I’m also doubtful that any non-celebrity actually gets to walk the red carpet. Or maybe they do. Long after the celebrities and paparazzi are gone! The above scene would be my idea of hell on earth. The very thought of that number of people pushing and shoving me about gives me the heebie-jeebies. I’m not so desperate to occupy the same breathing space as the celebrities that I’m willing to sacrifice my personal space and creature comforts (warmth). However a few weeks ago, I was presented with the opportunity to attend a movie premiere in Leicester Square and I began to seriously consider the offer. 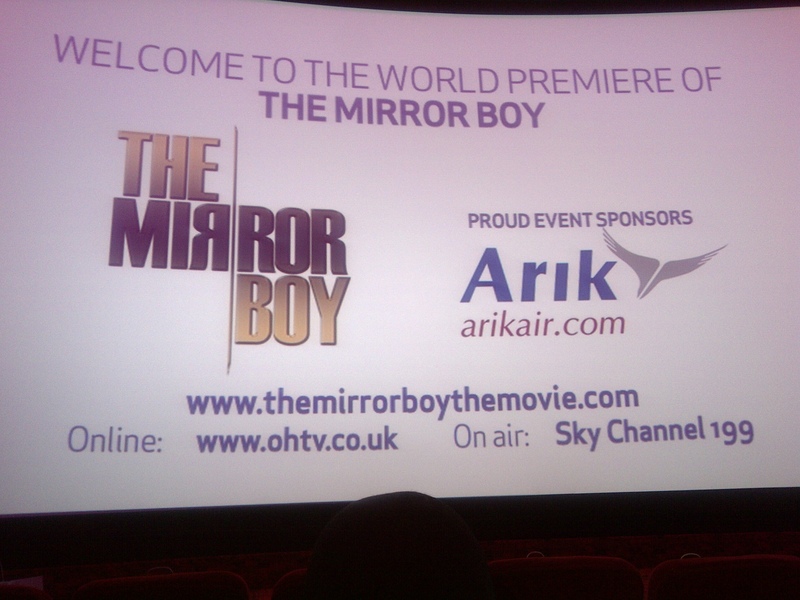 It was for a Nollywood movie, The Mirror Boy starring one of my favourite actresses, Genevieve Nnaji. It also featured Osita Iheme, aka Pawpaw, one half of the ‘Aki na Ukwa’ duo, Edward Kagutuzi and Fatima Jabbe. I had never heard of either of the latter two but seeing Genevieve was the clincher for me. Those who watch or have watched Nollywood movies would agree that apart from a negligible minority compared with the uncountable number of Nollywood movies there are, the overall quality of the industry leaves a lot to be desired. So I was expecting a lot more from this movie seeing as it was premiering in the West End. I had also seen a trailer for the movie and it piqued my interest. The information on the website said the doors would open at 8.00pm and we needed to be seated for an 8.45pm start after which no one would be allowed in the theatre. I went with Mo Cushla, his sister and her husband. We ran a bit late and arrived Leicester Square just after 8pm. When we arrived at The Empire, there was a teeming mass of people queuing. Well it wasn’t really a queue but I can’t think how else to describe hundreds of people crammed into the entrance, on the stairs and spilling out on the side-walk in front of the building. We weren’t sure what exactly was going on so we spoke to some security staff. They said all of these people were waiting to gain entry into the theatre. So we waited and waited some more. After a while, our party got lucky and some kindly member of staff took us in through a back entrance. When we got in, the theatre was already packed with just a few seats left in the reserved VIP area for which we had purchased tickets. We managed to find seats about three rows from the screen which meant we were looking up at the screen. The seats had goody bags on them. They contained a bottle of water, some marketing leaflets from some of the movie’s sponsors, a glossy magazine with all the movie blurb. We sat for a while then we heard applause from the back as the stars of the movie walked in. People rushed forward with their cameras taking pictures of Genevieve, Edward and Fatima. Eventually the compère announced over and over again for people to return to their seats so the movie could start. It took a while but they soon all returned to their seats. The compère introduced the director and producer, Obi Emelonye and Patrick Campbell, who said a few words. 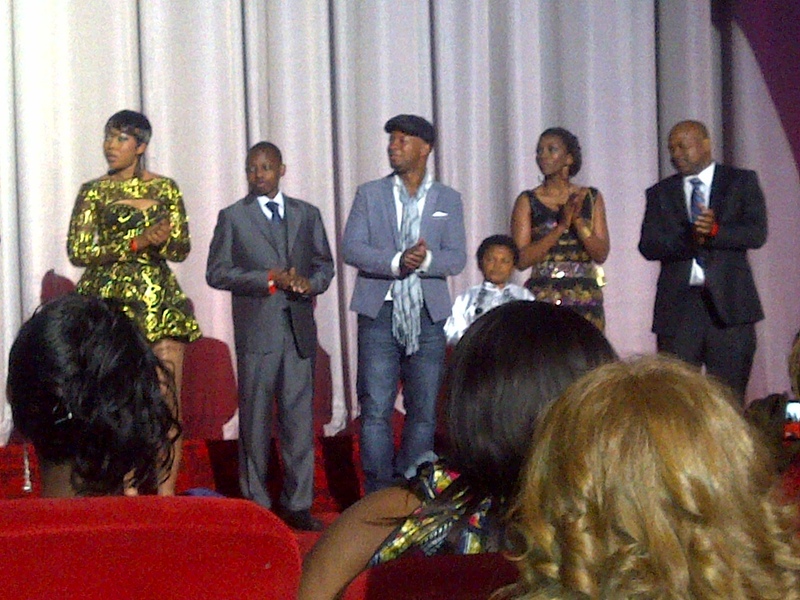 The cast was introduced and they also got to talk to the audience. The movie finally started about 9.15pm. I won’t tell you about the film in detail so I don’t spoil it for you just in case you would like to see it for yourself but I will share my thoughts. The overall film quality was excellent and unlike the scratchy and sometimes fuzzy picture you get from a lot of Nollywood movies. The setting (in London and Banjul) was fantastic and truly reflective of the story. I felt the storyline was really good but not as well executed as it could have been. There was some great comic moments even though it was a serious movie. The dialogue moved along well in some parts, yet in others, was a bit stilted. As usual Genevieve delivered a great performance but some of her co-stars were a bit wooden and unnatural in their acting.I think she is a very good actress, one of Nollywood’s finest, in my humble opinion and I really like her. Unfortunately due to the structure of the industry, or lack thereof, Genevieve doesn’t receive as much credit as she is due or doesn’t always get cast with equally talented actors. My first experience at a movie premiere was just ok. I enjoyed an evening out with Mo Cushla and got to watch a nice movie however I was a bit let down as I had hoped for more from the movie. Would I recommend you see the movie? Definitely! It wasn’t what I expected but it did make for good viewing. So please support the industry and see it if you get a chance. Would I go to another premiere? Hmm! Let’s just say I wouldn’t completely rule the idea out. Thanks for reading and tara for now. Discrimination against large feet. Sizeism? ‘Bata’ was a shoe company in Nigeria when I was growing up. Most of us who went to school in Nigeria in the ’70’s and 80’s had our school shoes bought from Bata. To say they weren’t the most flattering footwear would be a gross understatement. Apparently the company still exists in some parts of the world and they have an online shop. If like me you wonder if it still make those ugly shoes, Google it! ‘Bata’ became common usage for the word ‘shoes’ in the western part of the country. Anyway I tried to find a word that meant lover of shoes but couldn’t. The word for ‘lover of’ in English, originally from Greek, is ‘phile.’ So in my usual fashion and with my poetic licence, I put the two together to make ‘bataphile’ meaning ‘lover of shoes’. So I told you I don’t enjoy shopping much here but I am a ‘bataphile’. I do love shoes and am able to overcome my dislike for shopping just to get some. There’s just something about pretty shoes that does it for me. They serve the practical purpose of protecting your feet. Ok, I have to admit that there are some styles that do more harm than good but I’m not referring to those. Shoes have the innate ability to dress an outfit up or down. They are great morale boosters and they make feet look good, even ‘ugly’ feet. I love shoes. Different types of shoes. Great trainers for functional reasons not necessarily for aesthetics, strappy high-heeled sandals, court shoes, ballerina pumps, flat sandals, roman/gladiator sandals, slippers etc. I love them all. I wish I could afford to buy a pair of each style in every colour. The reason for this post wasn’t necessarily to let you know about my love of shoes but to gripe about something else. Could someone please enlighten me why it is that a lot of shoe manufacturers feel that it’s not worth bothering with anyone with feet larger than a UK size 8 (US size 10)? And why do the selective few who deign to make shoes in larger sizes reckon that people with larger feet can surely not possess any appreciation for cute styles or possibly have any fashion sense? While you’re at it, could you also tell me why shoe manufacturers automatically assume that large feet are always appendages of large calves? So that when I do manage to find knee-length boots that fit my size eight and a half /size nine feet, there is usually enough extra leather in the calf section to make an additional pair of shoes? My feet may be large but they are narrow and my calves slim. Who says large feet can’t do dainty and delicate? This is a scene that is replayed over and over again when I go shoe-shopping and quite frankly, I’m fed up. It’s sizeism! It’s discrimination of the worst kind! The kind that never makes the headlines. The kind that goes unnoticed as a large percentage of the world’s population will never experience it either because they don’t fall into this category or because they simply can’t be bothered with wearing shoes at all. I’ve a mind to start lobbying my local MP for a new bill to be passed in the Houses of Parliament. It will become illegal for shoe manufacturers not to make and shoe retailers not to stock pretty and fashionable footwear in larger sizes. Anyone who falls foul of this law will be liable to supply said footwear to the customer for the rest of their (customer’s) life. And should aforementioned customer die within five years of award under suspicious circumstances, then any offspring who has inherited similarly sized extremities shall benefit from same. What say you? Yea or nay? Why is that people, myself included, feel obliged to always say something even when it is obvious they really have nothing to say? Some of us even go as far as stating the very obvious like “Oh, your dress is blue”, “your nose is swollen” (to a hormonal pregnant woman like she missed it in the mirror and needed you to point it out) or something equally apparent. Duh! I must admit to being guilty of this social ineptitude every now and again. My mouth starts to move well before my brain engages into gear and I find myself saying things I don’t really mean, just to break the silence. I end up wishing I had just shut my mouth when I see the ‘yeah, right!’ look in the other person’s eyes. Sometime last year, I commented on a lady’s pregnancy. It turned out she was not pregnant but just had a large tummy. Talk about putting your foot in it! I was mortified. I wanted to just disappear, be teleported to some distant land or have the ground open up and swallow me whole. I apologised profusely for my gaffe and she was gracious enough to forgive me, laughing it off saying it was genetic. I don’t know if I would have been so gracious were the tables turned! I must admit that it is sometimes very difficult to avoid doing this. Those lapses in conversation make you feel so uncomfortable that you end up blurting out the first thing which comes into your head. Sometimes it’s simply the pressure of wanting to return a compliment when you have been paid one that lands us in hot soup. It’s only as the words proceed from your mouth that you realise how stupid and inappropriate they sound. I can appreciate why we do this every once in a while but it is really tiresome when one’s on the receiving end, especially if it is something you have to deal with on a regular basis. Let us pay heed to the words of Proverbs 17:28 “Even a fool, when he holdeth his peace, is counted wise…” and keep your eyes peeled to make sure your foot’s nowhere near your mouth before you speak. I would like to request a guest post from you. Like the last time, the concept for my February 2011 posts will again be LOVE. I want to make it guest posts from married/engaged bloggers who are willing to share their love stories, how they met their husbands/fiances or something related to that of their choice. I’ll be grateful if you’d be able to be part of it. To say I was keen would be an understatement. Myne is self-published but she’s also a great networker. She is extremely resourceful and has been interviewed by numerous magazines, e-zines, newspapers, bloggers and various other media. She has a large followership on her blog and I was really excited at the prospect of being profiled there. I didn’t manage to actually write and send the story till the 7th of February. In the meantime, since the beginning of the month, she’s been posting stories of other bloggers including my friend, Joxy’s which I have enjoyed reading tremendously. Even though I wrote it, I was looking forward to reading my story too. I’m subscribed to her blog so I receive an email whenever she updates it however due to the different time zones we both live in, the emails come in at odd times of the day. Last night, after I put the boys to bed, I came down to see a Facebook message from Joxy saying she was enjoying my story on Myne’s blog. I told her I didn’t realise she’d posted it and went over to read it myself. You could have knocked me over with a feather when I saw that instead of the story I’d sent her, it was Mo Cushla’s side of the story! I had told him about Myne’s request and without letting me know he’d gone to my laptop, taken her email address and contacted her asking if he could surprise me by writing and having her post his side of the story. I was gobsmacked and very pleasantly surprised. I couldn’t stop grinning. I was really touched by this gesture and it spoke volumes to me. The best part of it all was Myne published his story on the 16th of February 2011, the anniversary of the day we actually met 8 years ago! Then she posted my story today as a sequel to Mo Cushla’s. You can read Mo Cushla’s here and mine here. A big thank you to Myne for profiling both Mo Cushla’s and my love story. An even bigger thank you to Mo Cushla for surprising me in such a delightful and special way, I love you. Finally thank you to everyone who’s visited my blog as a result of reading the stories on Myne’s. I hope you come back again and again. something that causes or demonstrates a sense of well-being or satisfaction. These definitions make me feel good. At all times in my life, Jesus is my feel-good factor. Irrespective of what I may be going through, I always find solace and reassurance in His unconditional love for me. He is the one constant in the vagaries of life. However at different times in my life, a few other things put a smile on my face, leaving me feeling all warm and gooey on the inside and make me feel all is well with the world again. These could be any number of things including music, pictures, smells, food, experiences, movies, books, quotations, compliments, affectionate words and touches, to mention just a few. Tell me how I can keep from grinning foolishly at those declarations! In November last year, Gwyneth Paltrow starred in an episode of ‘Glee‘, an American musical comedy-drama television series set in a high school. She, along with the regular cast, sang Cee-Lo Green’s ‘Forget You’ (the sanitised version). I had seen him perform the song on Jools Holland’s show and heard it played on the radio but watching Gwyneth and the Glee cast doing it really resonated with me and since then it’s been a hit with me. The boys have cottoned on to it as well. So this song is my latest feel-good factor. I hope you enjoy it as much as we do! It’s also worth watching Gwyneth and the Glee cast too. Quite aspirational! Please share your feel-good factors. Thanks. When I was in Form 3 (Year 9) secondary school, we were introduced to Biology, the study of living things, along with Physics and Chemistry. We shortened all three subjects to Phy-Chem-Bio (pronounced fikembahyo). I was really lousy at science subjects so I don’t remember much of what we learned but I could never forget one of the topics – characteristics of living things. We were told that even though a non-living thing might exhibit one or two of these traits they do not qualify as living except they have all seven. I beg to differ as I ‘hear’ non-living things ‘talk’ to me and I talk back to them. I know it sounds a bit barmy but it’s true, at least I imagine it is. I carry out full-blown conversations with them the same way I do to human beings. They express emotions too. They tend to let me know if they feel mistreated. I know it’s weird but they usually make sense especially when it comes to matters of fairness and justice. Now before you have me committed to an institution for the mentally imbalanced, please humour me and read on. I imagine that non-living things communicate with each other and with humans somehow and since one of the primary forms of human communication is speech, I attribute this to inanimate objects as well. I’ll give a few examples to buttress my point and disabuse you of the notion that I need my head examined by a psychiatrist. In our bathroom, we’ve got a loo roll holder for extra loo rolls. It can hold up to three rolls. Cans: “Please pick me, I’ve been in here forever and my sell-by date is fast approaching“. Me: “I choose you, you and you. The rest of you’ll just have to wait till the next time. Don’t worry you’ll get used eventually”. I could go and on with examples of my discourse with inanimate objects but I think you get the idea by now and are most definitely convinced that my personification of them is indicative of neurosis, schizophrenia or bipolar disorder. However I’m not that different from most people. If anyone can tell me, hand on heart, they’ve never tried to negotiate with, cajole, argue with, tell off or never expressed any form of emotion (anger, frustration, exasperation, joy) toward some object, then I’ll stretch out my arms for that strait jacket. We each have our own foibles, eccentricities, quirks and idiosyncrasies. A small part though they may be, they contribute to our entire being making us unique and individual. So you see, I’m not certifiable just ever so slightly eccentric and occasionally whimsical. What little quirks do you have that make you unique? Please share. By the way, I’m Posting every week in 2011! I’ve decided I want to blog more. Rather than just thinking about doing it, I’ve started already. I will be posting on this blog at least once a week for all of 2011. I know it won’t be easy, but it might be fun, inspiring, awesome and wonderful. If you already read my blog, I hope you’ll encourage me with comments, likes and good will along the way. I would be really grateful if you would also tell your friends and family about my blog. Thanks for your continued readership and support. The origin of Valentine’s day is rather vague but the celebration of it most certainly isn’t. We do know though that it’s a day set aside to celebrate love between intimate companions. Like most commemorative holidays, it has been severely commercialised. No sooner than the Christmas decorations are taken down in January the red heart-shaped Valentine themed merchandise is put on display in shops. A copious amount of money is spent on greeting cards and gifts to show love and affection to spouses, boy/girlfriends etc. I’m all for celebrating love but I don’t think it should be for just one day in the year. I believe love should be celebrated, appreciated and applauded every single day. There is nothing wrong with the occasional pretentious and ostentatious display of love with all the attending gifts and cards but showing appreciation and expressing love should be a way of life rather than an annual holiday. Another downside of this extreme commercialisation is that single people may find themselves marginalised as if they are not already penalised enough at other times of the year. I appreciate that it is not everyone who is single who wishes it were otherwise, but there is a large proportion who wish they had someone to call their own. This must be a particularly difficult time for them. So I’m dedicating today’s post to anyone who finds themselves with no significant other on Valentine’s day. Being single on Valentine’s day is not great but it’s certainly not the worst that can happen. Count your blessings and you will be surprised at how rich your life is regardless of your marital/relationship status. Don’t let the media, commerce industry, anything or anyone else box you into a compartment and label you. You are a whole, unique person with a lot to offer when you finally meet your ‘valentine’. Here’s a poem I wrote a few years ago. Enjoy! But best of all, the joy of salvation. Yesterday I went into London for an exhibition. I had been asked by the operations director of my organisation to help man a stand at the BDC Exhibition Centre, Islington. I decided to take the train as I would be there all day and the parking costs would amount to a small fortune. I was very excited about the train journey as it would afford me the chance to start on the sequel to Francine Rivers’s Her Mother’s Hope titled Her Daughter’s Dream. I polished off the first 80 pages in the 45 minutes it took to get to King’s Cross Station. It was such a riveting read I barely looked up from the pages till the train pulled into the stop. The train could have diverted to Kathmandu and I would have been none the wiser. The nearest tube station to my final destination was Angel which is just one stop from King’s Cross. I decided to quickly read a few more pages while on the tube. Bad idea! I was so engrossed in the story that I didn’t realise when we pulled into Angel until seconds before the doors shut. I flew out of my seat like an Olympic athlete doing the long jump and barely missed the closing doors as I launched myself and my rucksack on to the platform. Phew! It was a really close shave! I spent most of the day, bar a lunch break, on my feet, giving out leaflets for my organisation and explaining what we do and how the service could be beneficial to them. I was shattered by the time 4pm rolled round and the one bright spot for me was the train ride back and being able to read some more of the fantastic tale Francine Rivers weaved. By the time I got to my station, I had read up to page 180. Having had such a long, tiring day, I thought I would doze off within minutes of going to bed but the book kept calling to me. After debating the wisdom of picking it up again at past 11pm, I rationalised that I would only read a few pages then go to sleep. Who was I fooling besides myself? The next time I checked the time it was almost 3.00am and I was on page 493! At this point, I gave into conventional wisdom and went to sleep. I finished off the last 70 odd pages this morning and I can’t recommend the books enough. Francine Rivers is such an artful story-teller. Her characters stay with you long after you finish the story. I would say this is Francine Rivers at her best but it wouldn’t be totally true. She is always at her best and kudos to her for once again delivering such a brilliant saga spanning four generations. It my hope to someday write just as well. On another note, I’d like to wish my friend, JustJoxy, a very happy birthday. I tried to write you a poem but it wasn’t flowing so I gave up and instead I’m borrowing the words of the well-known song, Forever Young. Breathe, Emma, breathe! You can do this. Don’t lose your nerve now! She took a deep breath and slowly exhaled. Schooling her features into a practised smile, her expression revealed nothing of the raging battle she was engaged in internally, willing her thumping heart to slow down and coaxing her breathing into a seemingly regular rhythm. She stopped listening and retreated into her mind, into the parallel universe she’d created where grammar simply didn’t exist. Harry continued to drone on about his ‘intellectual discourse’. That’s what he liked to call it; she could think of many other choice words but wouldn’t dare let them see the light of day. It was the only way she could get through their ‘date night’. What a farce! Anybody looking at them would think they were a regular couple. They were anything but! She’d noticed Harry first. He came in to Bookers once a week and would browse books for hours. She worked as the floor supervisor and usually dealt with his inquiries about some book or the other. She’d been enamoured with Harry, his extensive vocabulary and love for words. She could listen to the cadence of his voice as he spoke for hours. Well, actually Harry didn’t just speak, he “postulated”; he didn’t just think or speculate but “theorised and hypothesized”; he didn’t just argue, he “elucidated” and on and on. She wasn’t what you’d call pretty or even attractive. She’d come to terms with the fact that she would never turn heads like some girls did and had resigned herself to being an old maid as she had no hope of any man falling for her. So when he asked her out on a date, she couldn’t believe her good fortune. He took her to an open mike evening where he read out some of his poetry. She was impressed and felt even more privileged that he’d chosen her instead of any number of girls he could have had. One thing led to another and soon they were living together. She would have much preferred he made an honest woman of her, she was old-fashioned like that but she kept reminding herself that she was a getting a much better deal than she’d ever hoped. She wasn’t in the habit of expressing her feelings to Harry, at least not anymore. Every time she offered an opinion, he would shoot her down, correct her pronunciation, and tell her she’d used the wrong word or expression. She soon came to learn it was best not to say anything. But not this time! This was one time too many and she’d had it. “That’s it; I’ve had enough! I can’t take anymore of this nonsense! I’m leaving.” She yelled as she sprang out her chair back sending it hurtling into the air and landing with a loud bang, grabbed her handbag and started to walk out of the restaurant. Harry cast a surreptitious glance at the other patrons who were gaping at them, threw some bills on the table and slunk out of the restaurant. “What do you mean you’re ‘leaving’? He asked, stunned, as he caught up with her outside. “I mean, I can’t live with you any longer. I can’t take any more of your sesquipedalian* put-downs. I may be malapropistic* and commit logocide* sometimes but your constant employment of tautology* is driving me mad. The constant logomachies* are doing my head in!” She shook her finger in his face, just missing his bulging eyeballs. “You accuse me of verbicide* yet you yourself are uxoricidal*! Your orthoepy* doesn’t give you the right to constantly belittle me. You denigrate, disparage and deprecate me every chance you get. “What’s up? Cat got your tongue?” She asked as he stared at her in shock. She sauntered off, teetering in the high heels she’d worn to please him, not that he’d noticed or acknowledged, smiling in the knowledge that she could boast of something very few, if any, could – getting one up on Harry; and for the first time since she’d known him, he was at a complete loss for words.